At $8,500, Could This 1985 Porsche 928 S Put Some Grand in Your Touring? A few things aren’t right on today’s Nice Price or Crack Pipe 928. Consider it if you will, a work in progress. Let’s see if this project Porsche’s price makes it a work of art. Well, it looks like we started off the week in a happy place. How we got there was in a 1968 VW Baja Bug, and that car’s $2,400 asking earned itself a solid 60 percent Nice Price win. There’s just no better way to chase away a case of the Mondays. Volkswagen’s Beetle was once one of the most ubiquitous cars in the world. Built for decades on almost every continent on Earth, its numbers could at one time be counted in the millions. There’s a time for all things however, and the original Beetle’s time started to run out in the 1970s. It was during that decade that the car turned the mantle of being VW’s mainstream model over to the Golf. FWD and water cooled, the new Vee-Dub was the polar opposite of the rear-engine air-cooled Bug. The Golf would go on—in name at least—for almost as long as the Beetle (and counting), and like its predecessor, would spawn a number of different models. One of the cars the Golf sired was a one-off built by a VW dealer, Autohaus Nordstadt in Hannover, Germany. That car wrapped a widened version of the Golf’s Giugiaro-designed body around the mechanicals of Porsche’s grand touring 928. The uber Rabbit is still out there, but as you can imagine would be pretty dear if you were even able to buy it. In lieu of that opportunity we have a 1985 Porsche 928 S that’s not hiding anything. This grey on black S is describes as a work in progress. According to its ad it was originally a burgundy car and was purchased by its present owner out of Florida. It comes with 132K on the clock and a dogleg five speed transaxle in its booty. 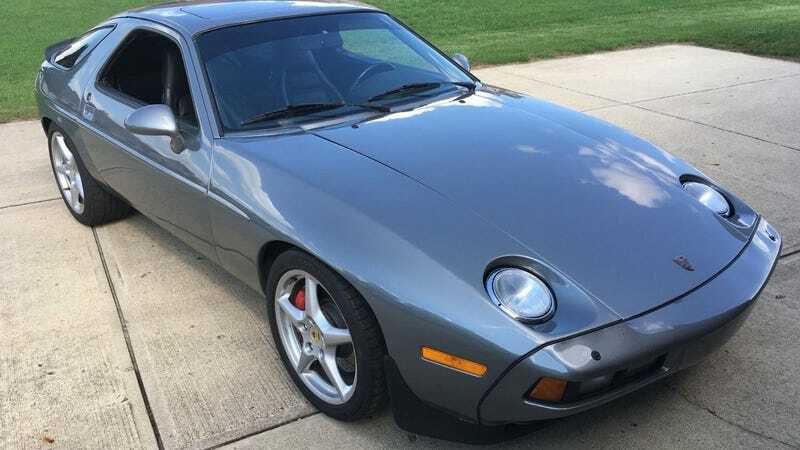 The seller says that over the three years of his ownership, the 928 has seen a major update to its interior, with new carpet and seat upholstery, plus the replacement of the dash and instrument binnacle with aftermarket fiberglass pieces. All the interior lighting has been converted to LEDs as well. That’s kind of expected as 928 interiors generally age like movie mummies exposed to air. Seeing how poorly they tend to hold up, I think Porsche must have made them out of grandma elbows and Religious Studies college degrees. This one benefits from the work so far, however there’s still some wavy gravy going on in the load area side panels. I’d also like to see the return of the factory tiller and gear knob, if only because I’m a sucker for a factory look. The bodywork seems straight, and the grey paint appears decent in the photos. However, the seller describes it as a ’10-foot car’ and there are a couple of obvious boogers in that respray. It rides on later 997 alloys and Continental tires with a decent amount of tread showing. Behind those sit upgraded Brembo brakes off an S4 edition, one of the current owner’s claimed updates. Under the hood, a 4957 cc V8 mill holds court. That was good for 288 horsepower and 302 lb-ft of twist when new. Now? Who knows. The seller says he drove the car from Florida to Indiana when he purchased it, and wouldn’t hesitate to go to such lengths in it as it sits. Is it all three-day weekends and Brony dreams here? Well, no. The seller, who claims that he’s run out of steam on the project, nonetheless says there’s still some work to be done. There is a small oil leak around the pan and the engine mounts need refreshing. The air conditioner doesn’t work - all the parts appear to be there but I hadn’t dug into the issue. The cruise control doesn’t work - not uncommon with this model. The sunroof electrical does not work. I’m sure it could be manually cranked open but I never tried. The side view mirror controls don’t work - they need to be adjusted manually. There is a very small drain in the electrical system. I replaced the relay panel but still haven’t found the drain. It takes about 4 weeks to drain the battery if the car isn’t used so I added a quick disconnect to the battery. The rear interior side panels are a little warped and some of the interior door trim needs attention around the windows. Yes, I know, scary scary. Electrical issues and old Porsches are not a match made in heaven. Also, that A/C? Ugh. At least winter is close at hand. None of these problems however, seems to be anything that can’t at least be addressed if not repaired in the short term, just as has been done by the current owner. The added benefit of there being some loose ends to tie up is that the price will likely reflect that work yet to be done. That seems to be the case here. If you follow 928 prices at all, you’ll likely know that they run the gamut from pretty much free all the way up well into five figures. This one asks a modest $8,500 for its trouble, and that seems a fairly common point for cars that need a little love. This one seems better than most at around that range and so it’s now incumbent upon you to vote on whether you think it’s actually worth plunking down some hard-earned cash. What’s your take, is this work in progress 928 worth that $8,500 price? Or, does it need too much to ask that much? eBay out of Lebanon. IN, or go here if the ad disappears. At $2,400, Would You Make a Run For The Border in This 1968 VW Baja Bug? For $20,000, Get a Turbine-Powered 928 With Free Shipping, FREE SHIPPING!